In this tutorial we will discuss replace(), replaceFirst()and replaceAll() methods. 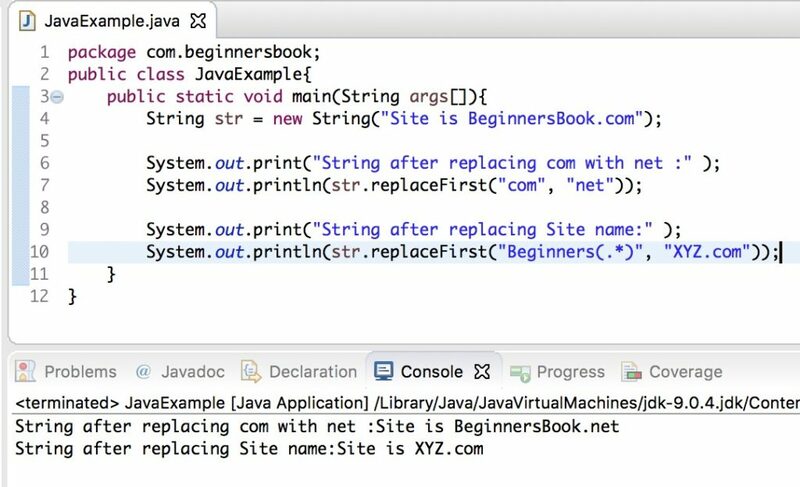 All of these Java String methods are mainly used for replacing a part of String with another String. String replace(char oldChar, char newChar): It replaces all the occurrences of a oldChar character with newChar character. For e.g. "pog pance".replace('p', 'd') would return dog dance. String replaceFirst(String regex, String replacement): It replaces the first substring that fits the specified regular expression with the replacement String. PatternSyntaxException if the specified regular expression(regex) is not valid. String replaceAll(String regex, String replacement): It replaces all the substrings that fits the given regular expression with the replacement String. 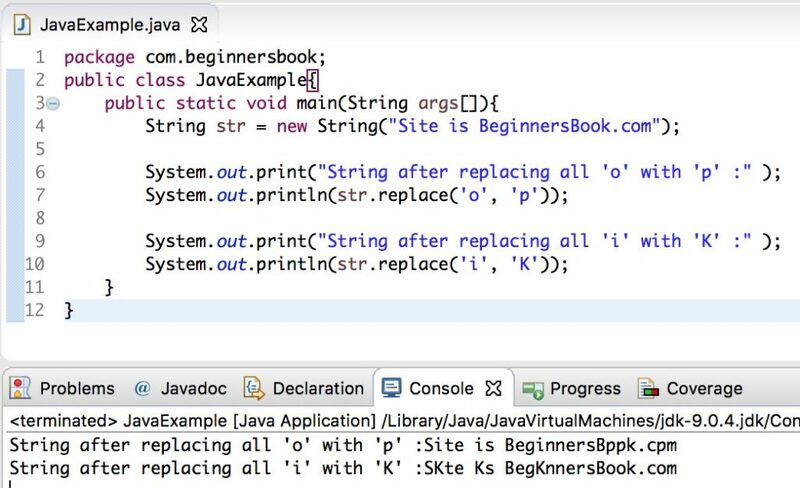 In the following example we are have a string str and we are demonstrating the use of replace() method using the String str. We have replaced all the occurrences of char ‘o’ with char ‘p’. In the second print statement we have replaced all the occurrences of char ‘i’ with the char ‘K’. 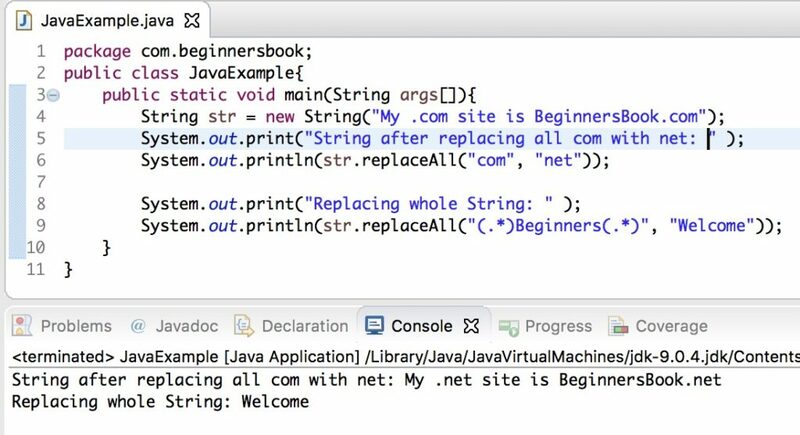 Here we are displaying the modified string using print statements but we didn’t actually changed the string str, to achieve that we need to assign the returned string of replace() method in a string and then that string can have the permanent changes. In the following example we are demonstrating the use of replaceFirst() method. This method replaces the part of a string with a new specified string. The difference between replaceFirst() and replaceAll() method is that the replaceFirst() replaces the first occurrence while replaceAll() replaces all the occurrences. In the following example we are using replaceAll() method to replace all the occurrences of a given substring with the new string. The difference between replace() and replaceAll() method is that the replace() method replaces all the occurrences of old char with new char while replaceAll() method replaces all the occurrences of old string with the new string. Basically replace() works with replacing chars and replaceAll() works with replacing part of strings.